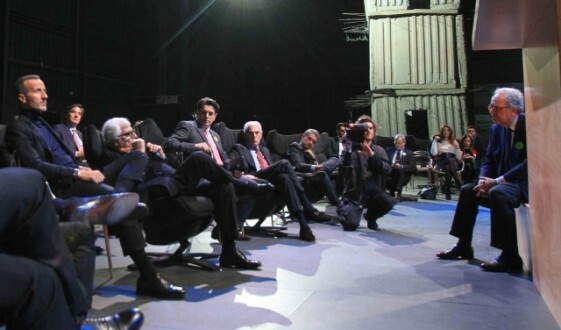 There were also Pasquale Natuzzi and Pasquale Junior Natuzzi among the 100 leaders of the Italian economy who partecipated in the “Number Ones’ Summit“, the interactive event organized by Class Editori at the Hangar Bicocca in Milan. The location of the event, set up especially for the occasion and called the “Agora”, was fully furnished with armchairs Natuzzi Re-vive: drawing inspiration from ancient Greek tradition, in fact, the 100 number ones were seated in a circle to interact with the five moderators. In addition to Pasquale Natuzzi and Pasquale Junior Natuzzi, many other important Italian entrepreneurs as Marco Tronchetti Provera, Urbano Cairo, Diego Della Valle, Luca Cordero di Montezemolo, Alberto Bombassei e Nerio Alessandri attendend the event; innovation, artificial intelligence and sustainability were the main issues discussed. The summit will be followed by an open interactive exhibition that will take place in China and America, while the testimonies of the number ones will be collected in a special issue of the magazine Capital, which will be published in four languages and distributed with some of the major international media.